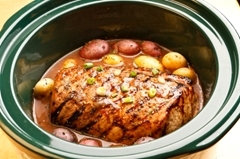 Healthy crock pot recipes make cooking for your family easy. Here we discuss tips for cooking with a slow cooker as well as share lots of healthy slow cooker recipes. Slow cookers are wonderful for working parents who want to provide healthy meals for family dinners. Although they cook food slowly, they allow you to fix-it-and-forget it. Once your ingredients are in your crock pot, there is no stirring or additional attention necessary until your food is ready for the table. Using a crock pot to cook also allows you to shave your grocery bill since the slow, moist cooking environment created within a slow-cooker is perfect for breaking down the tough connective tissue of less tender, but more affordable, grass-fed cuts of meat. Muscular cuts like chuck, brisket, round and shank will leave your slow cooker moist and tender. Avoid lifting the lid while cooking because it will release the steam and lower the temperature in your slow cooker by over 15 degrees, setting the cooking back by up to 20 minutes. Fill our slow cooker at least half full for best results. Be sure to defrost big chunks of meat before using in your crock pot. They will take much longer to cook and may not heat fast enough to prevent bacterial growth. Spread out the preparation if you are rushed in the morning by preparing all or part of your healthy crock pot recipe the night before and refrigerating it in the crock overnight. In the morning, simply place the crock into your cooker, add any remaining ingredients and turn in on. Don’t turn it on before inserting the crock since putting a cold container in a pre-heated cooker may cause the stoneware to crack. Many dishes like Pot Roast will taste best if you brown the meat in a frying pan before placing it in your slow cooker. Browning this way will seal the juices in the meat and provide more flavor. Although this step will make some dishes taste better, it is not absolutely necessary. This slow cooker pot roast recipe is wonderful way to enjoy cheaper cuts of grass-fed beef. The subtle orange flavor imparted by Tamrind paste or orange rind make this one of our favorite healthy slow cooker recipes. Simple yet delicious; this easy crock-pot pot-roast recipe is a wonderful way to enjoy cheaper cuts of grass-fed beef. Throw it together in the morning and forget about it until dinnertime. Super fast to prepare, this is Arrington’s favorite healthy crock pot recipe. Best yet, this recipe for slow-cooked short ribs of beef is both low-carb and succulent. The long, slow cooking of leftover meat and bones dissolves collagens and gelatins and results in a wonderful bone broth, full of flavor and nutrients to be used in recipes. Broth is wonderful on its own to settle a sore tummy after your child is sick. You can replace up to half of the water in your rice recipes with stock to make it more nutritious and much tastier. This recipe for chicken stock is one of our favorite healthy crock pot recipes. As with chicken stock, beef stock is wonderfully nutritious and much healthier than canned broth in all of your favorite soups and gravies. So simple to make, you should include this in your repertoire of healthy slow cooker recipes. Try this zesty, easy-to-make crock pot corn chowder recipe. This southwestern dish provides variety and you can make it spicy or mild depending on how much chili powder you add. Two delicious pork chop recipes as well as tips for how to cook pork chops safely by marinating them ahead of time. A quick and easy way to make delicious pork chops. Don't have a lot of ingredients on hand? No problem! Our favorite whole chicken crock pot recipes. Buying a whole chicken is less expensive per pound of meat than purchasing breasts or thighs. Here are a bunch of quick and easy ways to use that wonderful, organic, whole chicken you just purchased. Have a Favorite Crock Pot Recipe You Would Like to Share? Have a favorite recipe you would like to share? What about that secret recipe your granny used to make that the whole family loved? TIP: Since most people scan Web pages, include why you like this recipe so much in the first paragraph. Don't forget to add any cooking tips or substitutions information at the end! Click below to see reader tested and submitted recipes. Boy is your family in for a great meal!